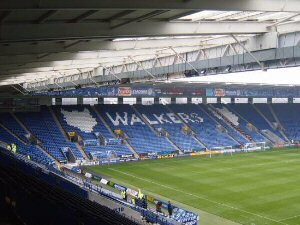 If you're ever going to go to Leicester City's Walkers Stadium then I seriously recommend that you take out a bank loan before hand, it's an extremely expensive day, the perfect example being that a 500ml bottle of Pepsi in the ground costs £2, all chocolate bars at £1 and a programme of just a handful of pages cost £1.50. It's certain not a ground you want to visit if you're on the dole. Infact, let me get something off my chest, I found it easier to find a place to park at Old Trafford than I did here, I was driving around for 30 minutes looking for a car park near the ground, the closest I could find was still a 15 minute walk away, at least I got a chance to visit my first ever Rugby ground, not that I plan to make a habit of visiting these grounds. Anyway, once we got to the ground there wasn't a lot to do other than the club shop, getting the tickets and watching the burger van change prices midway through me elling them what I wanted. Once inside the ground the prices didn't improve, but at least we could finally get into the ground. The ground was of an extremely good quality and the view was very decent. Despite sat at one end of the pitch it was still very easy to see exactly what was happening down the other end. 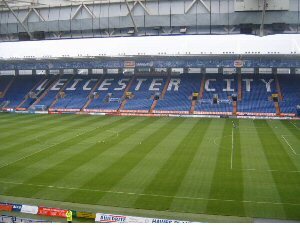 The only disappointing thing was that this game was a friendly so the other 3 stands (with the exception of the away section in the corner of two stands) was closed. 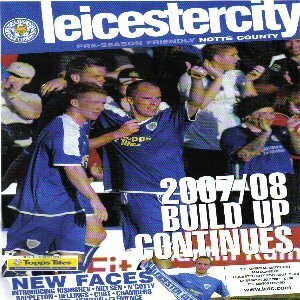 Despite of this the atmosphere was fairly decent, with Leicester fans seemingly overkeen to point out that they thought they're destined for promotion during the 2007/8 season (a season in which they were relegated). However, the majority of these chanters were chavs and they didn't take kindly to the rest of the fans not chanting. 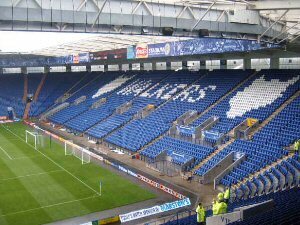 The one thing I noticed about Leicester is that fans will get up from their seat and then just stand in the aisles for minutes at a time before then finally going somewhere. This got increasingly frustrating when the ball was down our end of the field. Overall, despite the standing up, ridiculous prices and all the chavs, I really enjoyed this day out and is a ground I will certainly want to visit again in the future.